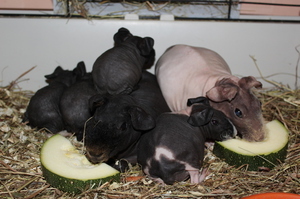 Hairless Guinea pigs come in different types, but the most common breed is the skinny. 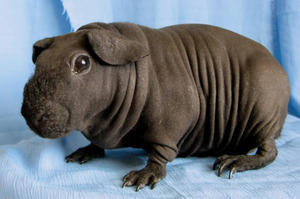 These small and sleek animals like the Hippo, appeared, due to the selection of American academics. Canadian and American scientists wanted to create a unique fauna, which would not have been burdened with the coat on the skin. First was albino, but subsequent experiments have allowed us to create bright colors and get away from the red shade of eyes. 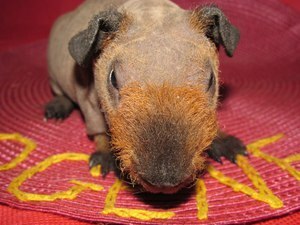 In the canadian lab by C. Rivers received view Guinea pigs skinny without the coat, that is, bald. This happened in the second half of the twentieth century since then, scientists have been crossbreeding of Guinea pigs and achieved a different coloring of their fur, some species slightly strengthened in the selection result your immunity. But despite the painstaking work, scientists have been unable to achieve in America recognition as a separate breed Guinea pigs skinny. 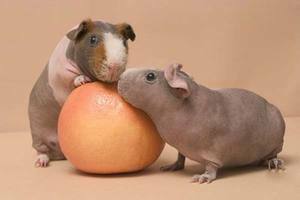 In the result of inbreeding over a long period of Guinea pigs with smooth skin got a weakened immune system and poor health. The uniqueness of the skinny variety that the gene that transmits the skin without wool on from generation to generation is recessive. This means that the crossing bald animal with an ordinary wool breed will result in a furry pet, but he will be a carrier of the hairless gene, this means the sudden birth of a hairless animal in his future offspring. If we talk about the length of the body of the Pets, males reach 30-35 cm, and females do not exceed 30 inches. Adult male Pets grow on average to pounds, but sometimes their weight is equal to 1.5 and even 1.8 kg. Animals are not born completely bald, their skin has a furry coating of delicate, barely visible gun, touching which creates the feeling of a velour cover. Stroking a warm body gives an unforgettable impression, these Pets want to touch on again and again. On the shoulders, head and neck Guinea pigs can grow soft short hairs. The head of a small animal well-decorated, located on a short neck with developed muscles, sturdy and durable. Eyes can be different colors, common are red, dark ruby and the ruby, sometimes brown with a darker shade or even black colour. On his head widely from each other are rounded and neat ears. The body of the pet with a well-defined shape of the muscles and a small rounded belly. For a small animal he has a somewhat deep chest. Animal has smooth legs with movable fingers. Due to short vertebrae almost not visible small tail. 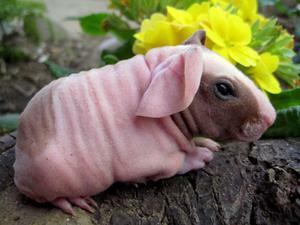 Defects are often present in developing animals due to crossbreeding for the production of offspring of close relatives hairless Pets. Was leaning from the birth of paws or uneven spine, the head is somewhat different from the standard form. The back may be short or soft. Such have not undergone the standardization of animals, especially love the owners, their life is in jeopardy, but to engage in procreation, they are not particularly recommended, not to produce bad copies in future periods. Normal body temperature is kept at from 37 to 39S, pigs live from 4 to 8 years, depending on the state of health, pulse heart rate ranges from 245 to 345 beats per minute time. Females reach sexual maturity in a month or a little more, and males become ready to create offspring in two months. Some people find animals repulsive, as the skin is no hair, but the taste of one person can not be compared with the preferences of the other, and many owners of these lovely animals give about their character only positive feedback. Their casual and permanent behavior characterized as gentle and kind. For children is highly recommended to communicate with these cheerful and tireless animals that the mere observation of cute Pets improves mood and relieves depression. Guinea pig skinny soon get used to the household, want to play with them and almost always respond to the return of the master after his absence. Love to be held in hands, pressed to the children, show their good attitude. These funny animals completely lacking aggressiveness, and they are always friendly with others living in the house Pets. Those pigs that have long been within the family, acquire habits that didn’t take friendly surrounding. Pets pick out different sounds and react to them peculiar behavior. An example is the sound of the opening door, then cute animals make a joyful whistle, which means the expectation of good food. broken bones, or even spine. To avoid such a situation, the top of their cells have to the animals could not reach or cover with metal mesh, which prevents the release. The life expectancy of a pet depends not only on the breed or received genetic set, but received care and accommodation in comfortable conditions. The average life expectancy of Guinea pigs is 6 years old, but there are known cases of longevity. For single pet requires a living space of 0.5 square meter. Often the hosts for your pet make not a cage, and a transparent house, for example, put the aquarium. This design gives the possibility to skip drafts to the weak health of the pet, further enhance the comfort of using lamp heating. At the bottom of a sawdust layer, thus experts do not advise to use a special wood filler, as it for these bald animals has unnecessary hardness and sharp edges that could hurt a defenseless skin. For Guinea pigs characteristic feature is learning to open locks and bolts, so their reliability need to be taken care of in advance. Care of bald Guinea pigs much easier because you do not need a daily combing wool, which some other species is long and confused. Due to the lack of coat, these animals are very sensitive to cold and changes of temperature. The cold can cause colds. In the room where pigs need to maintain a constant temperature of 20 to 22C. But raising the temperature to 26 degrees or more is considered uncomfortable for the pet, so arrange the ventilation of the room without drafts or remove superheated air forced way so that the air jet does not impinge on the animal (used fan). 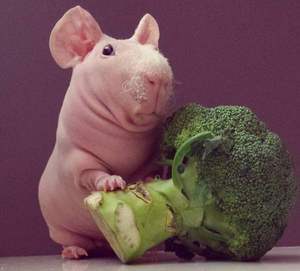 It is also important to maintain purity when growing hairless Guinea pigs. bathe pigs experienced breeders do not recommend at all if the contamination occurred Taurus, then use wet wipes you can use baby shampoo. Proper diet prolongs the life of your pet. Feeding should be varied and nutritious, and this is very important because the animal has to spend more energy on heating its delicate and defenseless calf. Guinea pigs have a higher metabolism and it is desirable to give them enough feed, but overfeeding is no more than a lack of food. grains (preferably sprouted) account for 20% of the total weight. In the grain mixture are often added or completely replaced by granular mixtures, specially selected for Guinea pigs, and experienced owners adding chalk and salt, vitamin preparations for animals and ascorbic acid. The water should be changed about three times a day, and in the summer up to five times animal need is clean water. Sea smooth pigs are happy to eat apples, cabbage, carrots, pumpkins, cucumbers and many other vegetables. Animals eat lettuce, dandelion, parsley, plantain, Daisy, clover. The branches of fruit trees to give them leaves, and the bark not peeling. This is necessary for grinding the sharpness of the cutters, as skinny throughout life grow teeth that grow long and prevent animal. spicy, fatty, salty and sweet sugary foods. These little animals are the fertility, and problems with reproduction they have. After puberty males and females are ready to continue the progeny. Females carry young for about 60-70 days, then in one litter there are up to 5 small newborn pigs. For Pets there is no difference in the time of year that they can bear and produce offspring, the little Guinea pigs are born all year round. fluffy cross-breeds with the other medium wool breed (without the gene), the birth of smooth kids has a small percentage. Smooth coat Guinea pigs is extremely important in those families where there are children or adults who are allergic to wool, so the hosts of different ages will gladly put in the house is warm, gentle and sweet creature.